Two reasons - you can focus on a specific micro-geographical area, and yet be flexible to move to another. Secondly, you can cover large county or even statewide areas, without the need to purchase multiple static billboards. Why consider mobile billboards as an alternative to stationary billboards? The ability to go to the public instead of waiting for them to come to you. Can we get the images of our campaign? Yes, we can take a picture of the location where the trucks are. Additionally, all our drivers are equipped with mobile cell phones. With constant communication, we can re-direct our drivers any time you wish to change target areas. How many people see our ad per day? This depends on where the unit is. Most of the time, on an average over 100,000 views per day. How long are the units on the road? On average our units are on the road 8 to 10 hours per day although we will run longer if you request it. Drivers are allowed to take three breaks per day, during which the unit must constantly be in the public eye. Why are Mobile Billboards cheaper than traditional billboards? The cost of productions is lower, there are lower government fees, and the most important - mobility makes them more affordable. Why should you select Mobile Billboards to execute your next marketing campaign? Because Mobile Billboards are cost effective form of proximity marketing, with fast turnaround, possibility of short-term running, a way to target your customers with zero advertising clutter and huge visual impact. What days of the week are the trucks on the road? Most trucks travel Saturday through Thursday and some truck companies run their fleet Monday through Saturday. How soon can my campaign be on the road? The amount of time before your AD hits the street, can range from one week onwards, based on the number of trucks in the ad campaign and whether it is a single or multiple truck campaign. Availability is limited. If urgent, we can put it up on in 3 days. Bear in mind, this depends on municipality and RPA approvals. Where can our trucks travel and be parked? They can travel everywhere in Dubai or Abu Dhabi. There are predefined areas where the trucks can park - contact us to get the updated list. Can I rent a truck with a truck side sign on it for a day, week or a month and have you park it for the length of the contract? Yes. You may be required to obtain permits or permission to have the truck parked in a specific location. Yes - we can develop effective artwork for the banner for your campaign. Additional hours can be arranged for at pro-rata the daily rate. This has to be defined in advance. In what cities do you operate? 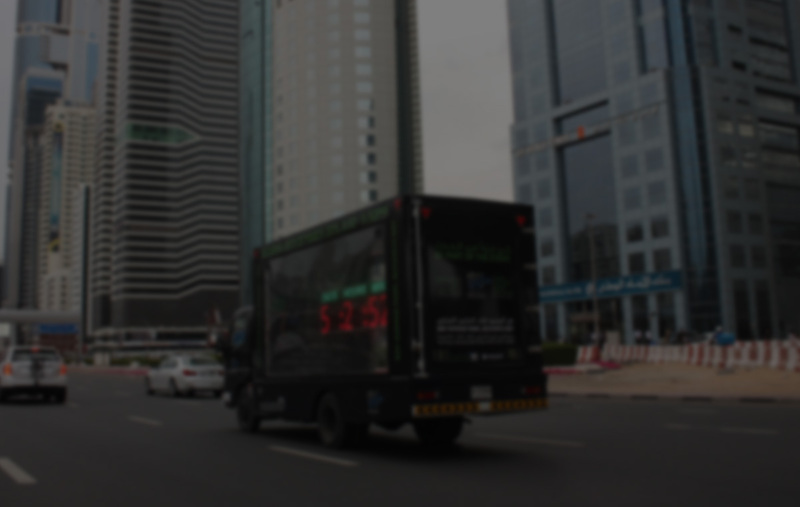 We operate in Dubai and Abu Dhabi. Yes, we do. We offer discounts to nonprofit organizations. Your quote will reflect the applicable discounts. What file formats do you accept for banner artworks? We accept high-resolution PDF, but also accept Photoshop (PSD), Illustrator and other traditional press-ready files. They should be accompanied by JPG files for the purpose of government approval. Our trucks have state of the art backlighting so it can be seen anytime. You can even plan a Full Nighttime campaign or an Overnight Parking campaign. You achieve total demographic exposure, impacting both consumer and trade audiences.